In January 2010 the Tartar Khan, Devlet Girey II raided into the Ukraine with over 70,000 Tartars supported by 10,000 pro-Swedish Cossacks some Poles and Swedish troops. After early advances they were driven back into the Crimea by Russian and Cossack forces. A large Russian army then invaded the Crimea but the campaign ground to a halt after the Russian supply lines were cut. In May 1711 the main Russian army supported by Cossacks advanced from the Ukraine into Moldavia. The Moldavians led by Demetrius Cantemir, rose against their Ottoman overlords and joined the Russians. However, the Russian advance was slow and as a consequence the Walachian ruler failed to declare for the Russians and joined the Ottomans. Peter advanced the army in three divisions down the Pruth River. Peter was unaware that the Ottomans commanded by Grand Vizier Baltadji had mobilised a massive army (at least 100,000 men) supported by Tartars, Walachians and the remnants of the Swedish army and their allies. They crossed the Danube and arrived at the Pruth River. The advance guards clashed on 7 July as the Ottomans successfully bridged the river. At the same time the Russians rear guard was attacked by the Tartars. The Russians began to withdraw and join up their divisions. They were attacked by the Ottomans as the main army arrived. The Russian line held and by 9 July they had consolidated their position. Before the defences could be finished the Ottoman infantry led by Janissaries attacked. Again their were held off and the Ottomans regrouped for a siege. Somee 300 Ottoman guns began to bombard the Russian camp. Peter trapped between the Crimean Tartar army and the Ottomans he was only saved from complete destruction by a favourable treaty offered by the Grand Vizier. Whilst a bribe may have helped the Vizier was also concerned about his casualties and a possible intervention by the Austrians. Peter agreed to abandon the fortresses of Azov and Tagenrog, the Black sea fleet and then to withdraw back to Russia. Peter had a very lucky escape on the Pruth in 1711. Had his army been destroyed he would have been imprisoned in Istanbul. The modernisation of Russia would have been halted and European history could have taken a very different turn. Many dismiss the Ottoman army of the 18th Century but this campaign and the later campaign against Austria shows that they were still a force to be reckoned with. The Russian infantry looked pretty much like any Western army of the period and they left their pikes in storage. They had battalion guns to strengthen their firepower. The cavalry consisted entirely of dragoons and horse grenadiers. 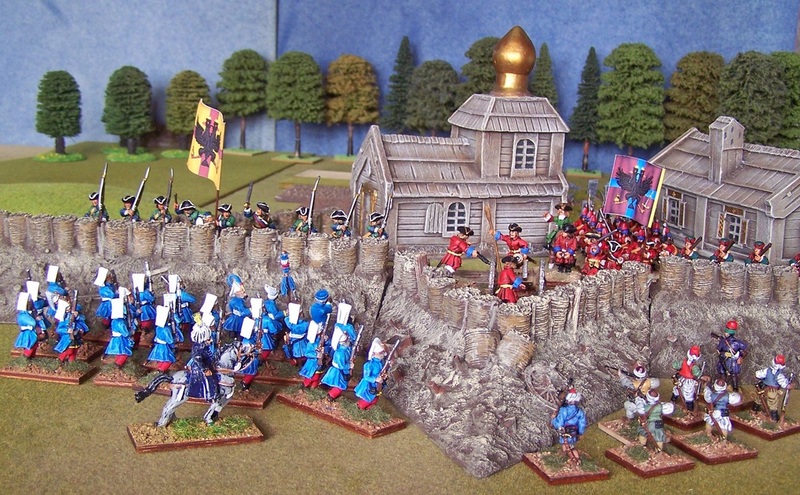 The regular army was supported by Cossacks that included light horse and musket armed infantry. 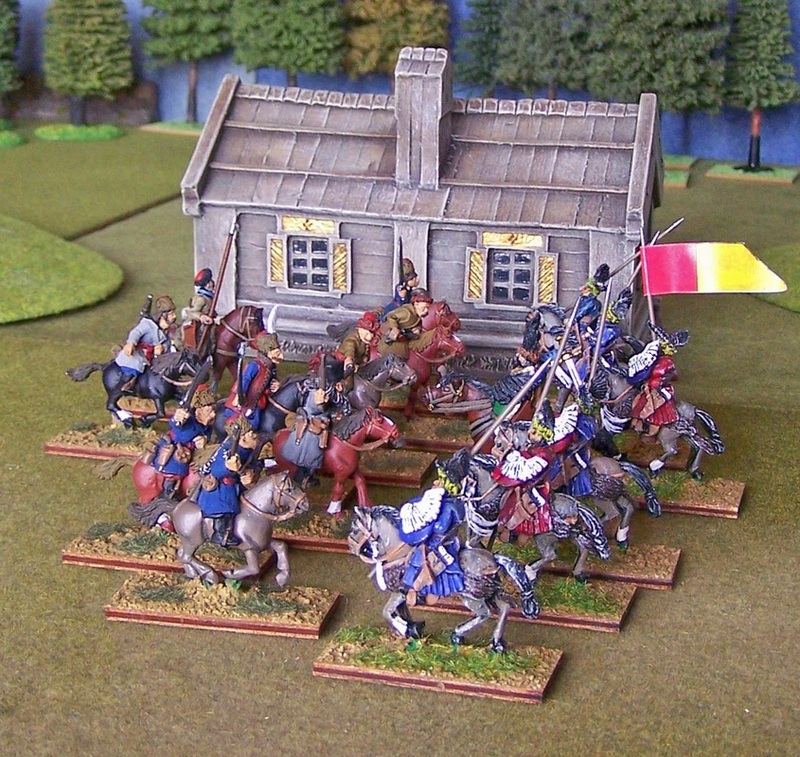 The Moldavians provided some light horse Hussars and Arnauts. The Ottoman army had an infantry core built around the Janissary infantry and light foot. The Sipahi cavalry had largely abandoned armour and carried a range of firearms. They were supplemented by light horse including the Tartars. 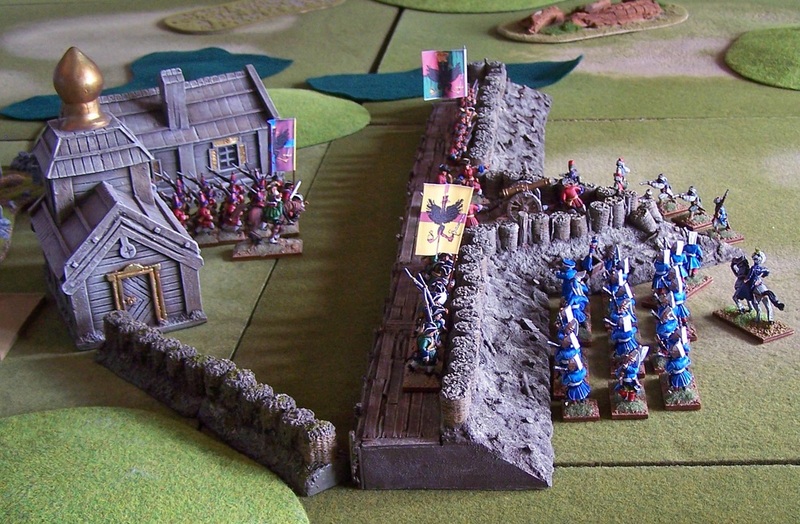 The figures used in this game are 28mm. 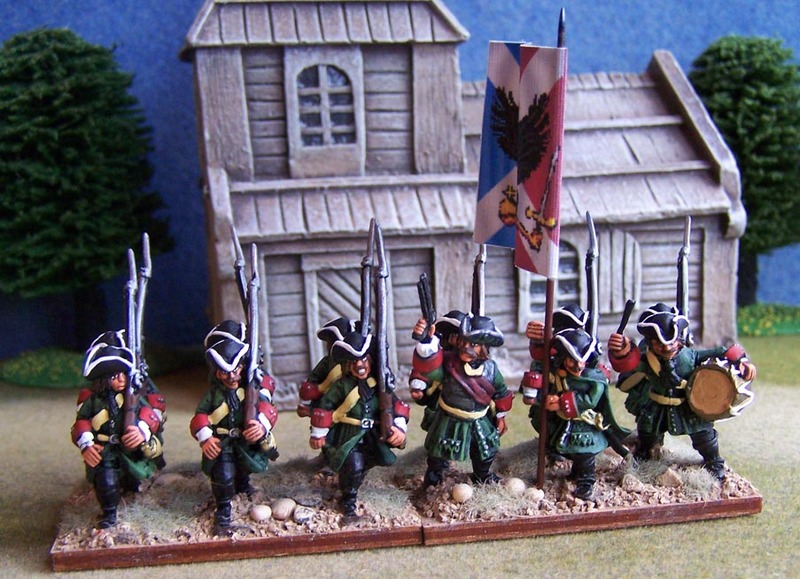 The Russians are primarily from the Reiver range supplemented by some Foundry. The Ottomans come from many ranges including Old Glory, Redoubt and Dixon. 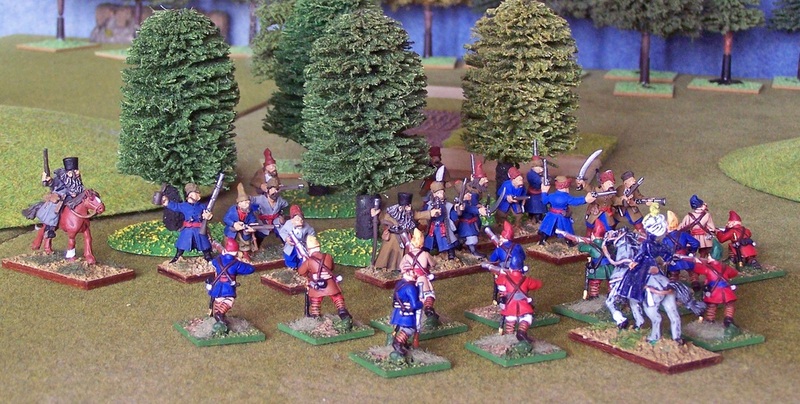 A quick look at the Janissaries shows the difference in interpretation over what is ‘28mm’. The rules are Black Powder a new and fun set of rules that we are just getting to grips with. Definitely not for the micro measuring competition gamer! There is an excellent article on this campaign in the Pike & Shot Society journal Arquebusier Vol XXXI/II. Osprey MAA 140, 260 and 264 provide uniform details. For more detail see Virginia Aksan, Ottoman Wars 1700-1870 and for the Russians Dawn of the Tsarist Empire, by Nichola Dorrell.